Can you imagine life without the Internet? It has become intertwined into just about every aspect of our lives, especially for our children. We use it day to day without really thinking about how it benefits us. We connect with others, shop online, watch movies..the list is endless. However, if you are trying to run a business online, you might need a little assistance with a data processing service. Companies called host providers are designed to help serve everyone from websites to Internet users. Web hosting is a service that makes it easy for you to have the space you need to run your website. 24/7! Are you looking for a great web hosting directory? It can be difficult to navigate through all the web hosting sites out there, but WebHostingRating.com can help you find a reliable company at the best price. With real independent reviews and customer ratings and reviews, you can search their web hosting guide, directory, and then compare companies to find the best one that suites your needs. It doesn't matter if you need individual or business hosting, WebHostingRating.com will reliably help match you to the most appropriate service. I don't know about you, but it seems that I go through more socks than I can keep in Mason's drawer at any given time. Whether it be from loosing them in the washer or Mason outgrowing them or wearing them out, I always seem to be buying Mason socks. The other problem I have is that Mason has feet like his Daddy...BIG! Before age 2, I took Mason to get his feet measured for summer shoes and he was already measuring a size 9! In the meantime, I do love socks and I love sock shopping for Mason. Baby and toddler socks are so cute! I love to match Mason's socks with his outfits, especially if I know he will be without shoes. Mason is also the typical boy who will wear his socks out, and quickly! 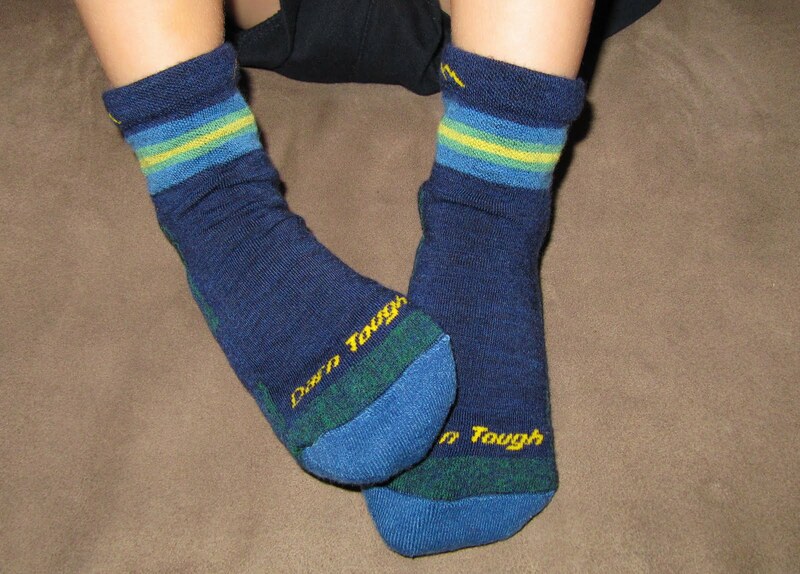 Darn Tough Vermont brand of socks perfectly address all of Mason's needs! Right off, these socks are adorable. The patterns are perfect for any occasion. These all-weather performance socks are made from shrink treated Merino wool. You will find a high density cushioning on foot bottom and a reinforced heel and toe. There is an elastic support around the arch and ring toe construction for a comfortable, invisible seam. How could these not be perfect for you child? Of course, since Mason is the typical opinionated 2 year old, he will tell me right off if he does not like his shirt, pants shoes, or socks. If Mason doesn't like how his shoes or socks fit, he says, "No Ma, No!" and insists I take them off. Mason wore these socks without a hitch. The bottoms of the socks looked so super comfy and felt cushiony, perfect for those long days of pre-school coming in September. I am sure his feet will stay warm and protected from the hard wear a toddler puts out throughout the day. "Simply and without strings or conditions: if our all weather performance socks are not the most comfortable and durable socks you have ever worn, return them for another pair or your money back. No strings. No conditions. For life. When you are really serious about something you make it yourself." Now that is a quality sock that is made to last! Darn Tough Vermont provided us with samples of the products reviewed above in order to facilitate the review. All opinions are 100% our own.